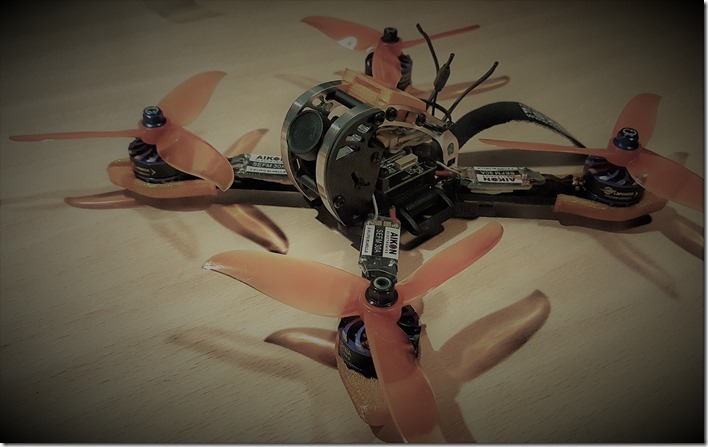 One beautiful thing about flying FPV quadcopter, is building your own quadcopter. After my warpquad 230 and my X210 (QAV-X 210 clone) it was time for a new build! Since I’m flying I always loved the builds from Davis Helvensteijn aka Dquad. Their latest frame is the Dquad Obsession. A great looking frame, with an unique top part of 7075 aluminium. In this build log I will show you how I build up my Dquad Obsession. First things first. Let’s lay down all the parts. You can see this frame has all the stuff you need. The only thing missing is a nice foam pad for underneath your frame to protect your battery from scratching the screws. I always “dry” build my quads. Just to know if everything fits before I’m going to build in all the components. 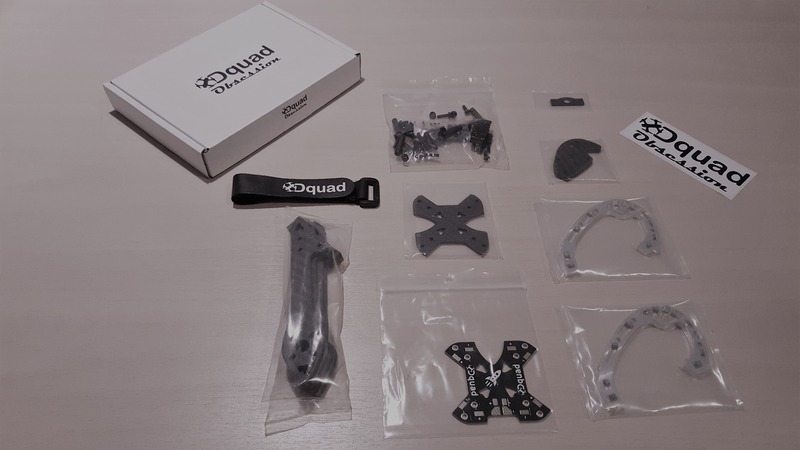 Dquad has a build assembly manual on their website to help you fit all the at the right place. 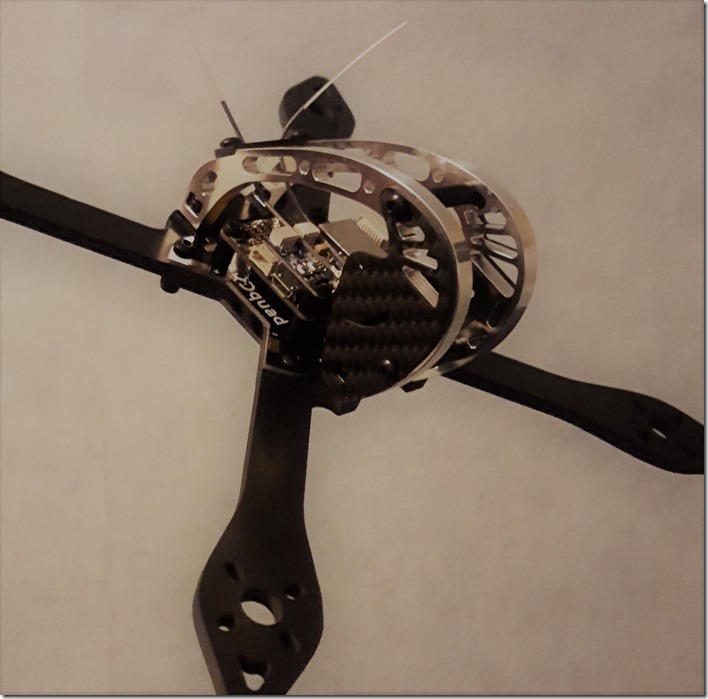 This frame is a pretty standard build, apart from the attachment of the top part. You need to put some lock nuts in the side pockets of the aluminium but at my build these pockets where to small. I had to file out some material from the pockets to make them fit. Not a big deal, but I expect everything to fits perfectly in a €100 frame. Next it’s time to dissemble the frame again and start with the build. After I’ve read some story’s about breaking bottom plates, I decided to use two bottom plates instead of one bottom plate. 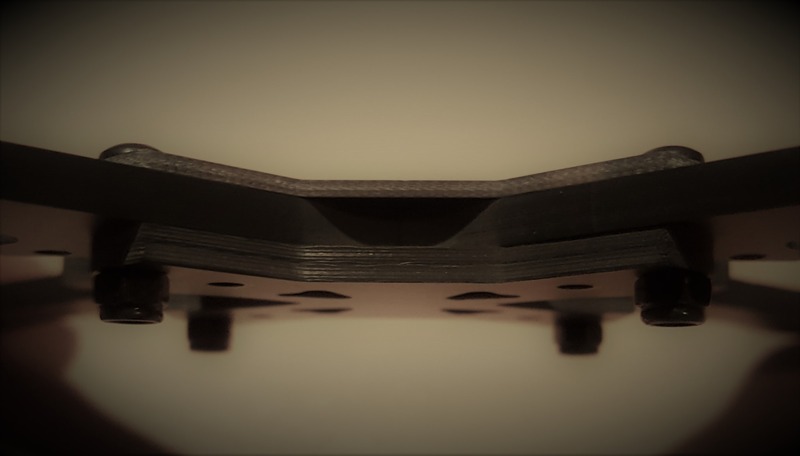 Standard the kit includes two bottom plates in case you don’t want to use the integrated PDB. This will make the build a lot stiffer. I assemble the two bottom plates together with the four arms and the PDB. First only use the outer screws and screw them on loose until you have aligned all four the arms. Then you place the XT60 bracket with the XT60 connector to the frame/PDB. It’s tight but you can solder up the XT60 to the bottom of the PDB. After this you can solder up all the other solder pads you are going to use on the PDB. Also screw on the inner screws with the standoffs. Because of the double bottom plate these original screws will be to short. Instead I’ve used 12mm screws. When the frame is prepared for soldering I’m going to work from the outside to the inside. So first up, the motors! 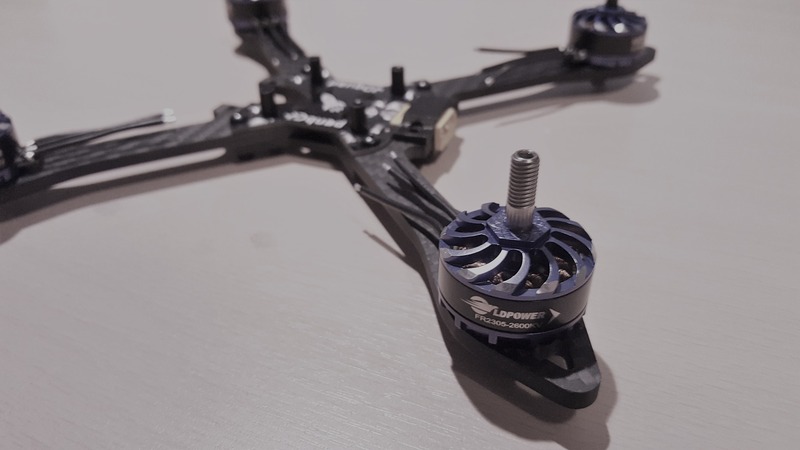 The LDPower FR2305 2600kv look insane. I like that you can solder the motor wires by yourself. Make sure the motor screws aren’t too long! Just secure your screws inside the motor with some Loctite. Next up are the Aikon SEFM 30A ESC’s. You can check the full thrust results of these here. Before I mount the ESC’s, I will make them DSHOT ready. Out of the box DSHOT is not possible. But by removing this red component (capacitor), DSHOT will be possible. You can remove this component easily with a sharp knife by just placing the knife underneath the cap and whip the knife up. This at your own risk! Pre tin your motor pads on the esc. 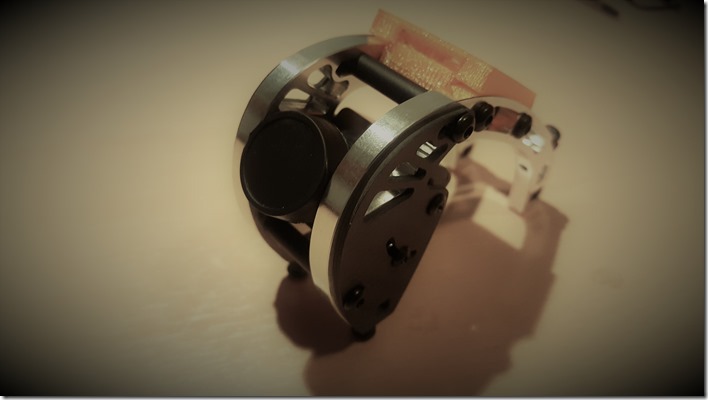 Then stick the esc with some tape on to the arms at the right position you want to place your esc. Always try to stay close to the PDB if possible. Cut the motor wires to length, strip the wires and pre-tin the wires. Always try to keep some slack in the wire. Solder the motor wires to the esc motor pads. After doing this for all four motors, you will have a great looking wire mess (lol). 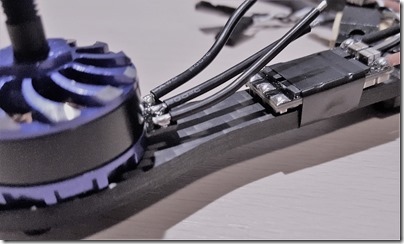 Now before soldering your esc’s to the PDB, first put your shrink tube over the esc’s! You won’t be the first to forget to put your shrink tube over them and after soldering up everything, you can start all over again. Cut your ground and positive wire to length. Again, with some slack. 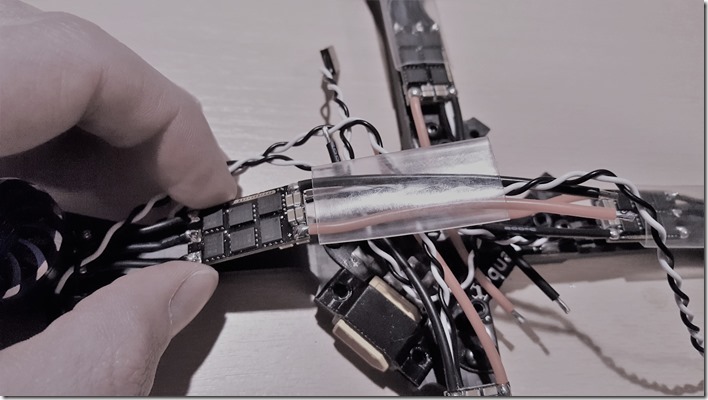 I also cut my second ground wire to the same length as my main ground and solder this ground to the same pad, so I can have a as clean as possible connection to my flight controller. Strip the wires and pre-tin the wires. Solder the wires to the PDB. Next – it’s time to solder up my camera and video transmitter (vtx) wire harness. Solder up your ground and positive wires to the appropriate pads. Also solder the Vsense wire from the Foxeer Arrow to a positive pad. I’ve used the positive pad of one of the front esc’s. I’ve also soldered my main power for the receiver and the flight controller to the appropriate pads. Also cut your signal wires and receiver wires to the right length and solder them to the pads on your flight controller. For my receiver I’ve chosen the FlySky X6B. 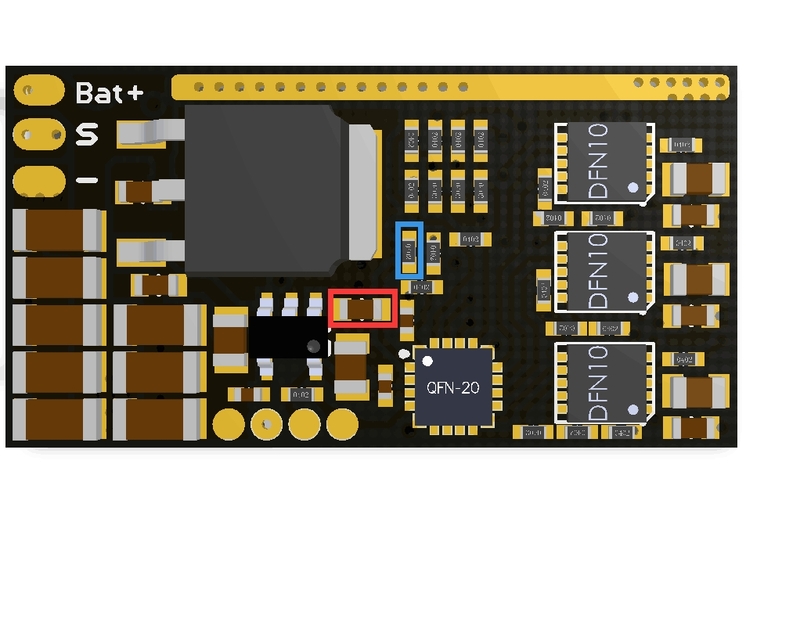 A great feature of this receiver is you can place this receiver right on top of your flight controller stack. Right on top of my receiver I have placed the vtx with some double sides tape. And with the receiver in place it is time to put the top on the frame and this will finish my build of the Dquad obsession. It was a damn easy build with the right components. There is enough space to fit everything in place! 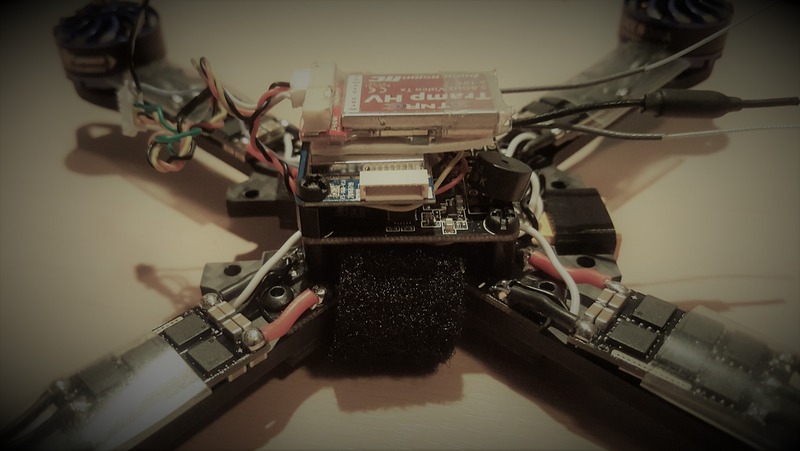 Let me know if you’ve got any questions about this build and/or programming the flight controller. I want to say thanks to Niels for his time and effort to write this build log! 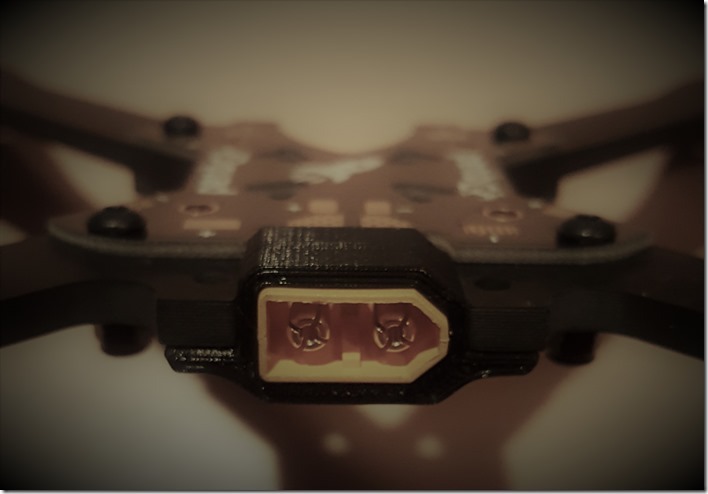 Please follow him on Instagram for more cool FPV stories!